Tips: For questions about shipping, orders, discounts, etc. Please click customer service, your problem will be solved faster than ask a new question. Q: is it compatible with 5T wifi? Q: What is size of bottom hole? The size of bottom hold is 5mm. 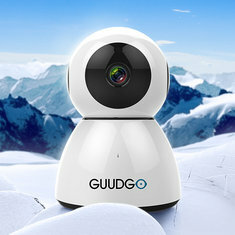 Q: Is this a ip camera or not? I mean, can I watch my room over the internet and my smartphone/tablet from any other place in the world? Will this camera work in Germany? You can see the video with amazon cloud service or you could view from the SD card. Q: Also i can connect fm my app ios/android via wifi and Not the Lan connection possible? Yeah, it is HD 1080P. You can install in the ceiling. On-board storage : Built-in TF slot, up to 64GB. Q: We want to be your dealer ? Maybe you can use the “contact us” to contact the banggood customer service team. Q: What is the maximum size for an sd card that this camera can carry? Support Max 64G TF Card. Q: how's the voice audio quality is to high and audible in talk option? I want to buy 3 peices of same.